Pyon Moo Do Kids is the martial arts program at Traditional Martial Arts Academy that is specially designed children ages 6-12. 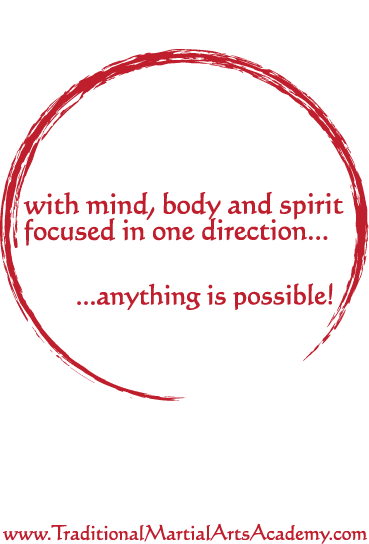 Based on Pyon Moo Do, or The Warrior Path of Transformation, our comprehensive adult program, our children’s curriculum is rooted in powerful, effective martial arts and designed for the needs of children and the concerns of parents. At Traditional Martial Arts Academy, we recognize that all children can benefit from martial arts instruction. A structured, positive environment—where courtesy and respect are emphasized—can contribute to children having improved behavior and focus. The practice of martial arts is fun and physically demanding—a great outlet for the restless energy that is natural in children. It is not unusual for parents and school teachers to report significant, positive changes in children within days and weeks of beginning martial arts classes. This focus us has led us to take a different approach to teaching children that is unique to our program. We concentrate on reinforcing effort rather than achievement. For instance, common practice in martial arts schools is to test students for a new belt frequently to keep them interested and to help them feel good about themselves. In our Pyon Moo Do program, belt testing is a much rarer event. We’ve designed such a rich, full curriculum that rapid advancement would lead to poor quality. There is simply too much to learn for that approach. We emphasize the experience of the progression, rather than the end result (a belt). This way, students learn the value of process rather than achievement. Why do we think this is important? When a child is purely goal-oriented, they project their sense of identity and self-worth onto an external object, their goal. If they stumble in their efforts, difficult feelings of fear, frustration and questions of self-esteem can arise. But when a child is focused on the process, with a goal simply offering a direction, then stumbling is no big deal. The child is excited to get up and keep going because they have a love for the process. This is an important life skill that we encourage students to take outside of the martial arts class. We do this through requirements at every belt level to demonstrate specific effort at home, school and in the community. Established by you, the parent, in collaboration with your child, his or her school teachers, and our teaching staff, these “effort-requirements” are designed to meet the needs of your child and to express your family’s values. Many schools have code of conduct requirements for advancement through their curriculum. Things like being polite, keeping one’s bedroom clean and getting good grades are required to earn new belts. These are great behaviors of course. But what if a child is already getting straight A’s and good at keeping their room tidy? What if a child is having difficulty in other areas of their life, or simply having difficulties that are more pressing than being courteous? This is why we partner with you to determine what is the area of effort most appropriate for your child. Additionally, every child must participate in a community service project before testing for their next belt level. This prerequisite teaches children the value of doing things for others. Plus, they find out how much fun it can be to help the community. Kids have done all types of projects including neighborhood cleanups, worked in kitchens and clothing donation centers for the poor, and tutored other children. And it works! Kids love our classes and get excited by the prospect of advancement and learning new material. So when they are told they must show specific effort in home, school and the community, they are much more motivated and eager to apply themselves! Our students love coming to class. The classes are fun, the material is exciting and they get to meet such great friends. A big part of why our students love Traditional Martial Arts Academy so much is the community. Students are supportive of each other in class and, though discipline and structure are an important part of our method, so is laughter. Kids tend to leave class in a good mood, regardless of how they felt when they arrived. Our community is not just for the students. Our parents are always encouraged to stay and watch class. Many friendships have been formed while sitting on those benches! Pyon Moo Do Kids is a program that offers children deep martial arts instruction, life-changing experiences, and the opportunity to understand themselves and the world around them more deeply. Classes are taught by an exceptionally well trained staff. In many schools, being an accomplished martial artist is qualification enough to be an instructor. Though our staff members are all excellent martial artists (each with a minimum of four years training experience), we don’t think this is enough for your child. Our teachers also receive ongoing education in educational psychology and child developmental psychology. Their martial arts training is augmented with exercise and kinesiology theory. Whether it is our curriculum, our unique approach to the complete growth of your child, or our highly trained staff, Pyon Moo Do Kids is a unique program that rises above other schools as a martial arts program for children. Our tuition may be higher than some of the other Austin-area martial arts programs for children, but you definitely get what you pay for. If you are looking for another extra-curricular activity to keep your child busy, we are probably not the school for you. There are several martial arts programs in South Austin that have fun programs that kids enjoy. But if you are looking for a profound, life-shaping experience for your child that will follow him or her home, into school and through the rest of life, Pyon Moo Do Kids is for you!